Repsol Honda Team’s Toni Bou came out guns blazing in the World X-Trial Championship, completely overwhelming adversaries in the process. Bou took his tally of triumphs to eleven in Barcelona’s Palau Sant Jordi – one of city’s Olympic jewels – as 9,600 spectators turned out to witness the start of the 40th edition of the event. The 2017 FIM X-Trial World Championship got off and running tonight in the Catalan capital and current champion Bou didn’t disappoint. Victory came after a spectacular exhibition in most sections to bring the trial ace to an eleventh win at the venue. In spite of picking up five points at the first hazard, the rider aboard the Montesa Cota 4RT managed to turn the result around and finish the qualifying in top position. In the final Bou overpowered the competition from start to finish and even had time for a bit of showboating as he completed the spectacular waterfall section on one wheel. Bou put on an extraordinary display of quality which brought the Palau Sant Jordi spectators to their feet, riding almost the entire route error-free – bar section three that no-one was able to overcome. The champ concluded the event with just five points on the scorecard ahead of second place Adam Raga on 21 points. Jeroni Fajardo posted third spot with 24. 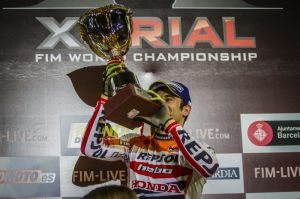 Toni Bou thus becomes X-Trial season’s first overall leader. Jaime Busto marginally missed out on his objective of landing a place in the final round. Repsol Honda Team’s young Basque promise came fifth in qualifying – his best performance to date in the Palau Sant Jordi. Busto, showing noticeable signs of improvement, is clearly adapting to the tricky speciality. Japanese rider Takahisa Fujinami, likewise narrowly missed out on a place in the final, picking up two more points than team-mate Jaime in the final standings. In one of the more problematic sections, the Japanese veteran was affected by a shoulder injury that impeded the normal completion of the rest of the trial. Next stop for the FIM X-Trial World Championship is 11th March in Wiener Neustadt, Austria.